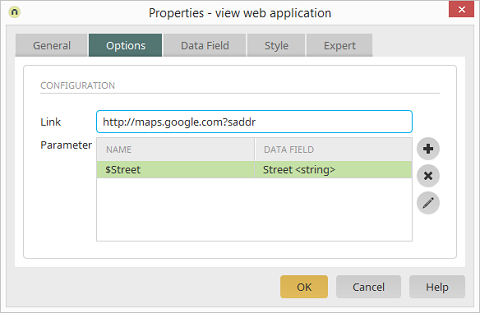 With this control type, you can add dynamic links to web applications, such as location and destination for a web application that calculates routes, to an Intrexx application. The parameter name is shown here. The selected data field is shown here. Opens a dialog where you can select the data fields that should provide the values for the request to the web application. Intrexx automatically adds the values, which are contained in the data field, in the browser when the link is clicked on. Removes the currently selected parameter from the list. Opens a dialog where the settings of the current parameter can be edited.